The price listed is based on the resale condition of the 2009 Silver Maple Leaf Olympic Coin(s) you sell and deliver to Kitco. Sell your 1 oz silver rounds, including the silver buffalo round from various mints. You can sell silver rounds, silver coins, gold coins and other precious metals securely and profitably with Kitco - we make it easy! Kitco's famous website is the world leading source of silver prices, market information and insightful commentary. Track the price of silver per ounce every day on kitco.com. 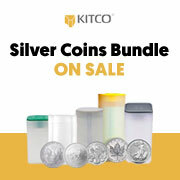 Kitco is the only bullion dealer allowing you sell silver online, and in complete security. Courier pickup is even offered in many areas of Canada and the USA. Whenever you are ready to sell your 1 oz silver coin, the 2009 Olympic Edition Maple from the Royal Canadian Mint (RCM), we invite you to simply create your own packing slip on our convenient online store. Select the product you want to sell from our product list. If you are have any trouble, please don't hesitate to call us at 1 877 775-4826 (US and Canada), 1 514 313-9999 (international). One of our Customer Service Representatives will be happy to assist you to complete your sale. Why not consider storing your metals in a Kitco Allocated Storage (KAS) account or a Kitco Pool Account. This saves on transportation costs and turnaround time for your transactions, so you may wish to consider these options if you are interested in buying and selling silver and precious metals in the future. For more information on how to buy and sell silver, our team of trained experts can be reached at 1 877 775-4826 (US and Canada), or at 1 514 313-9999 (Worldwide). Our email is info@kitco.com. Let us help you! Why sell Silver Olympic Coins to Kitco? Kitco is a trusted leader in the silver coin precious metals industry. Silver bullion and other precious metals sold by Kitco are recognized in bullion markets around the world. With our focus silver bullion coins, you can benefit from our silver olympic coin prices and premiums that are highly competitive in the industry. At Kitco, we make it easy for you to manage your wealth. You can buy and sell silver coins and other precious metals using our convenient online store, or by contacting our team of highly trained precious metals specialists. Backed by our global information network, Kitco is proudly serving our customers since 1977.